Carob Cottage is a sunny, light and airy one bedroom cottage with a large bedroom that has a double bed, large ceiling fan and patio doors leading onto the south-facing sun terrace. 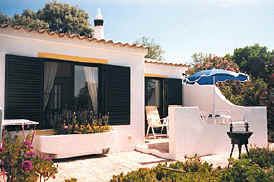 Carob Cottage has a large new luxury bathroom with shower, washbasin, bidet, WC and shaver point. The spacious lounge/diner is tastefully decorated with cane and pine furniture and a wood burning stove for those cooler winter evenings. The lounge has Satellite TV, video recorder and radio/CD player, a selection of reading books , puzzles, chess set, playing cards, there is also a sofa bed and patio doors leading onto a private south-facing terrace with table, cushioned seating , cushioned reclining chairs and a Bar-B-Q area. The kitchenette comes fully equipped and comprises of a fridge with freezer compartment, microwave, electric kettle, toaster and electric hob. There are fantastic panoramic sea views and spectacular countryside views, just what you need for a tranquil and relaxing holiday. The gardens are marvellous with many bushes, plants and fruit trees, along with quiet areas to relax and absorb the views. There is a returnable security bond of £100 for this cottage. This bond will be returned after your holiday providing the cottage is left in a clean and tidy state and that there are no breakages.